A modern take on Sicilian traditions at this villa near the sandy beaches of the Torre Salsa nature reserve. 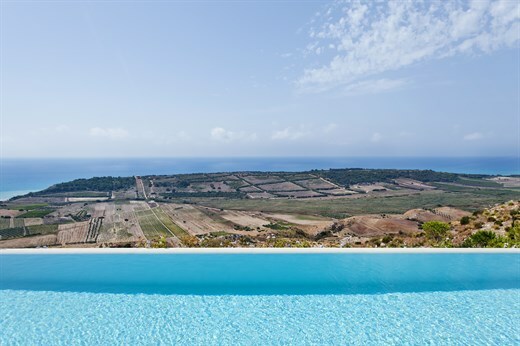 Set high on a hill overlooking the coastline west of Agrigento and the Valley of the Temples, Il Canneto is a stylishly designed modern villa offering peace and quiet and a superb panoramic infinity pool. The fabulous views take in the sparkling sea and the Sicilian landscape immortalized in the books of Inspector Montalbano! Inside: the main entrance at Il Canneto takes you into the spacious main living area with its high white beamed ceilings (a feature that continues throughout the house) and its clever combination of contemporary furnishings, such as the stylish hanging fireplace, and more traditional pieces of Sicilian furniture. Large glass doors open onto the internal courtyard on one side and onto the pool terraces, with their sea views, on the other. To the right of the luminous living room is the large kitchen diner, which will delight keen cooks thanks to its professional oven and stove, its sea views and its direct access to a sheltered courtyard al fresco dining area. Also on this side of the living area is a double bedroom with en-suite shower room. Heading back across the living room, one comes to another two bedrooms, the sea-view master double, with en-suite bathroom with sunken bath and shower, and another double with en-suite shower room. Lastly, in a room below the pool is a fantastic wellness area and gym including a Turkish bath (for up to four people), a hydromassage tub (for two people), a cyclette, a tapis roulant, a couple of fitness balls, a shower and a WC. Outside: Il Canneto is surrounded by non-stop terraces, some offering fabulous views, others cosily sheltered and shady! Just outside the main entrance is an aromatic herb garden and the rest of the grounds are planted with Mediterranean flowers, shrubs and trees. Accessed from the kitchen, the outdoor dining area features both a pull-down barbecue and a pizza oven. A flight of steps leads up from here to the rooftop terrace, the perfect panoramic spot from which to take in the views, sip an aperitif and toast the sunset. This is a particularly hedonistic experience if you’ve spent a sunny day lounging around and swimming in the superb infinity pool, whose swimming pump will help you work up an appetite for that pizza you’re planning to make! A panoramic shaded pergola and sun soaked solarium on the other side of the house complete the outdoor living spaces. The road accessing Il Canneto is unpaved and a little rough and so we recommend guests hire a suitable vehicle with good ground clearance. Il Canneto is situated on the southwest coast of Sicily midway between Agrigento, famous for the archaeological site of the Valley of the Temples, and Sciacca, a working fishing town with a well preserved historic centre and some excellent restaurants. A little further west along the coast past Sciacca, is another superb archaeological site, that of Selinunte. The gorgeous long sandy beaches of the Torre Salsa Nature Reserve and Eraclea Minoa (which also has an impressive archaeological site) are just a few kilometres away, while if you head inland, you will find some historic hill-top towns, such as Caltabellotta, and the stunningly positioned castle of Mussomeli. "The villa was great. The local beach was also great. We were surprised and delighted it was quieter than normal holiday destinations." We loved Il Canneto! The house is cozy and decorated with great style. The staff have been very helpful and nice with us. we appreciated it a lot. We are happy that there is an agency like yours which offers top service in top locations. Thanks!!! We had a great week in Sicily, a genuinely great holiday made all the better thanks to wonderful villa staff who all were so caring and attentive ensuring we all had a happy holiday. We had a wonderful stay, as Il Canneto is a magnificent and liveable villa. We thoroughly loved the incredible kitchen and spent many happy hours at night in the kitchen, cooking, drinking and laughing! The local house lady and her husband Paolo were just great. They kept the pool and grounds beautifully tended , yet were discreet whenever they had to be there . The villa was great. The local beach was also great. We were surprised and delighted it was quieter than normal holiday destinations. Overall we truly enjoyed our holiday. Photos didn't do Il Canneto justice. All really good. Overall we had a great experience and the nature reserve at Torre Salsa was a real highlight. Il Canneto and your company are both class acts. Best of all were the views from the villa - it was hard to make the effort to go out! It was fantastic. The villa was very well appointed and delivered on all areas... The quality of the villa and the support service was a real bonus. In villa cook great. Hospitality and insight into Sicilian life a bonus.